To me, there are many things that separate Disney parks from all the other parks, even Universal. One of the biggest things is theming. Disney is chuck full of it. Everywhere. And one of the best types of theme is the back story. 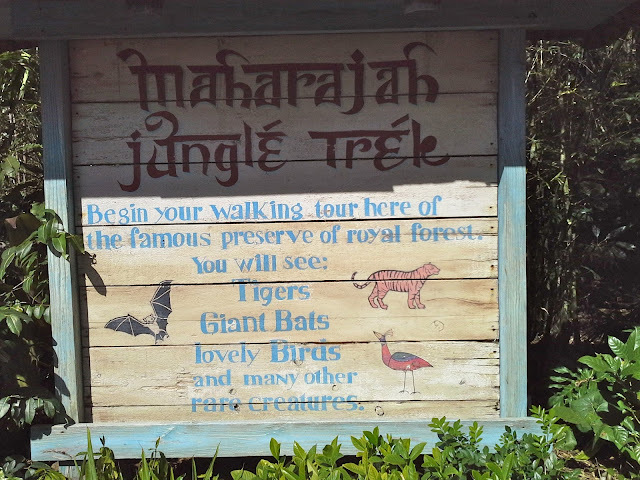 Many attractions all over Disney World have a back story and just about all of Disney's Animal Kingdom has one, as well. I would guess around 98.7% of the people that attend the attraction or land or eatery, have no idea there is such a story behind it. But its there in all the little details if you look closely enough. And I want to help you learn these stories so you too can better appreciate the areas of the park. The first I want to address is the Maharajah Jungle Trek. This origin is greatly detailed and, to be fair, a little more obvious then some of the others. Mostly because there is a sign giving a brief origin story to the zoological trail. The trek (at least where you leave the bat exhibit) is the old hunting grounds of King (or Rajah) Bhima Disampati who founded it in 1544. The good old King decided it would be a lot easier hunting for himself, and his noble guests, if everything was enclosed to keep the animals from leaving the grounds. So, he created the royal preserve with a hunting lodge. But irony is a pretty cruel fate, and King Bhima was killed, mauled by a tiger. There is actually a mural in the last tiger exhibit depicting this. This, also, is the site of the attack. The exhibit I am talking about is the one you can see from the bridge just before getting to the aviary. But more on the aviary later. The first display of the tigers is just past the bats. It's here where much of the hunting occurred. You see the King built these fountains to attract tigers, since they love the water so much. The overpass you stand on is where the hunter would lie in ambush raining arrows down on the tigers. Rajah Disampati is also depicted here in a fresco. You will see a hunter with a cocked bow. That's Bhima. There are three other rajahs depicted in these murals. They are the three rajahs who succeeded Disampati. They are not named but are called the Rajah who brought peace with nature (he has an ornate blue gown and carries a flower and who restores the temple after war has brought it down ), the Rajah who brought peace with man (he wears a red turban and carries what appears to be a golden birdhouse, he represents material pleasures of wealth), and the Rajah who brought peace with the animals (an old hermit holding birds, who suffers at the whim of nature and abandons the people). It is these three kings who brought peace to the place and made it a place where nature is nurtured. Of the four, only Bhima carries something destructive, a bow and arrow. But not all went well for the land of Anandapur. Like much of Asia, it became a colony. How do I know this? Well, there is a sign that calls this place the "Royal Anandapoor Forest", a deliberate misspelling establishing the role Imperial Britain had over the land. Like I said, most guests would never pick that up. Well, now you know. Also, on many signs, the English doesn't seem quite right. Well, that's because the locals tried translating their language to the language of their colonial leaders. But, also like much of Asia, Anandapur regained it's independence after World War II. The people of Anandapur again controlled their beloved forest. Again, a sign lays this out to some degree for the visitor, assuming they took the time to look. Not many places set the origin tale out like that. There are many signs of the villagers who live in the area throughout the trek. At the entrance, the locals have used old newspapers as insulation. There is a blackboard at the bats' exhibit maintained by the locals. The sign is an attempt to help the villagers (and you, the tourist) understand the importance of the animal to the ecosystem and to everyone's well being. Just before seeing the ruins of the hunting lodge, there is a tree decorated with scarves and bells. These have all been left by the villagers. The scarves and garland on the coral tree are offerings. The bells represent prayers that have been answered. Just past the Eld's deer and banteng, there is a small garden. This is a medicinal garden maintained by the locals for, well, growing medicines. Also, take a close look at the water jugs just before crossing the bridge. Here, there is potable water, a rarity in the jungle, so the villagers are constantly here to refill the jugs, sometimes even leaving a bicycle behind. And, as you cross the bridge, there are more prayer flags overhead. These flags help carry prayers up to the heavens. Now, before I told you there was more to the aviary then just a bird exhibit. Before entering it, you have reached the tomb and sarcophagus of Ananta, the man who founded the Kingdom of Anandapur. There are carvings here that depict the story of these lands and the relationship of man and beast here. The first carving shows man and beast living peacefully. The second shows all the animals huddled under a tree for shelter, afraid of what man has become. The third shows just what he has become, cutting down a tree and scaring away animals. The fourth shows the heavens really ticked off at man which is shown by severe storms and flooding. And finally, the fifth shows man and beast again living together. The man shown in these carvings is Ananta. It is his tomb you enter just before heading into the bird area. The aviary itself was once the grand ballroom of the lodge. Look down and notice the fancy tiles on the ground. It shows that no matter what nature will reconquer what man does.